Polycrystalline mullite fiber. Temperature Grade: 3000°F (1650°C). Fibermax® Needled Blankets are high temperature, lightweight and flexible products manufactured from polycrystalline mullite fiber that can be exposed to temperatures up to 1600°C (2912°F). These blankets contain no organic binders or other additives which cause outgassing fumes or associated problems. In addition to exhibiting excellent resistance to most corrosive agents, Fibermax Needled Blankets also resist oxidation and reduction. 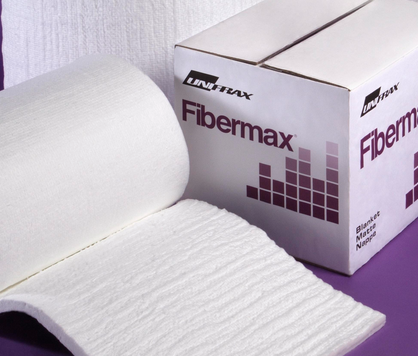 Fibermax Needled Blankets are virtually free from shot (unfiberized particles). That makes it ideal for use in environments where the presence of shot is undesirable. The low shot content results in a product with extremely low thermal conductivity. Its unique fiber layup and needling process provide Fibermax Needled Blankets with outstanding consistency, handling strength and resiliency at elevated temperatures.